I still don’t think this is a good idea. The Houston City Council on Wednesday approved a $1 million economic development deal to help Costco build a store outside the city limits. In a rambling discussion ending in a 12-3 vote, supporters argued that the sales tax rebate would drive further development in the area around the site of the proposed store, at Interstate 10 and the Grand Parkway, generating revenue the city would not collect otherwise. Opponents said they had heard no argument for why the rebates were needed for the store to be built, or, in Councilman Andrew Burks’ case, said the deal did not ask enough of Costco. Corporations should take a more active role in funding after-school and summer jobs programs in the city, Burks said, and should give preference to veterans in hiring. The store would sit on 14 acres Costco has under contract in the Cimarron Municipal Utility District. The city since 2003 has had an agreement with the district under which the parties split the revenues of a 1-cent sales tax collected within the district’s boundaries. The city provides only animal control services there, and property owners pay no city property taxes. Economic development experts have said the area is likely to develop without incentives, given that a new segment of the Grand Parkway connecting I-10 with U.S. 290 will open in December. Councilman C.O. Bradford, who joined Burks and Councilman Larry Green in opposing the deal, took a similar approach. Councilman Ed Gonzalez said the proposal was necessary because Costco was considering a nearby site that would generate no revenue for the city. See here for the background. I get why Council agreed to this, but the question I haven’t seen asked – let alone answered – is what the return for the city would be compared to what was likely to be built on that property if no rebate was offered. We all agree that something would be built, possibly this very Costco, but even if you accept that Costco would have gone elsewhere, something else would have been put there eventually. As such, it makes no sense to compare the revenue the city will get from making the deal to zero. Compare it to some scenarios where something else gets built, and compare it to that. Is it still worth the money the city is giving up? If it is, then I can live with this. If not, then we need to do a better job of making economic projections. The Huffington Post take a look at that great boondoggle in northwest Harris County, the Grand Parkway Segment E extension from I-10 to 290. Texas faces a transportation funding gap of $315 billion over the next 20 years, according to the state’s transportation commission. 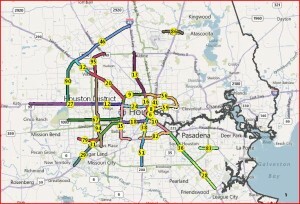 Ten of its top 20 congested roads are in or around Houston. Yet while the mitigation plans for congestion around several of those existing roads remain unfunded, the state is moving ahead with the construction of more than 180 miles of beltway called the Grand Parkway, segments of which will run right past the new North American headquarters of ExxonMobil. The total price tag for the project, which will require the use of eminent domain, is estimated at $5.2 billion. Since the 1960s, planners in Houston have dreamed of building the Parkway, a massive third beltway in the suburbs and exurbs beyond the Sam Houston Tollway, which itself rings the 610 Loop near the city’s core. Coming up with the money for the road, however, has never been easy. For decades the grand plan has languished; so far only two out of its 11 segments have been built. But in January the Texas Transportation Commission, appointed by Governor Rick Perry, decided to assume authority for several segments of the project. One commissioner said the project was particularly important for the Texas Department of Transportation, commonly called TxDOT, because ExxonMobil was considering moving its North American headquarters to a brand new, 385-acre corporate campus north of the city near where the road will some day go. Suburban Harris County, which surrounds Houston and where the campus is located, had struggled to find a way to pay for its parts of the Parkway. In January, ExxonMobil’s final decision about that campus had yet to be publicly revealed. Civic boosters seemed to suggest that without progress on the Grand Parkway, the company might leave the region. “Exxon representatives have stated very clearly to me that TxDOT moving forward on the Grand Parkway is essential, and that if that did not happen, they would not select this site,” transportation commissioner and Houston real estate developer Ned Holmes said. He added that it was “kind of a deal-breaker” for the company. All of this is familiar to us. Just as a reminder, this is going to cost more than the entire 2012 Metro Solutions plan, at a time when TxDOT is broke, and unlike the Metro project nobody ever got to vote on it. It’s not going to do a thing to improve mobility for the vast majority of Houstonians; if anything, it’s likely to contribute to congestion in the future as development moves into new places. It has the distinct whiff of a sweetheart deal to benefit ExxonMobil and a handful of developers. I have always wondered why the opposition to this has not spread much beyond the transportation policy wonks like the CTC and the anti-toll road crowd, but whatever the case, it’s too late now as ground has been broken on the Parkway extension. Like it or not, here it comes. Who wants to help build the Grand Parkway? The State of Texas wants to know. The Texas Department of Transportation, which has responsibility for the parkway in Harris, Montgomery and Chambers Counties, is moving toward use of a public-private partnership to get faster funding for the multibillion-dollar, 184-mile project. This spring, the Legislature renewed the public-private option for building the Grand Parkway when it passed a bill that extended TxDOT through 2015. An amendment to the bill authorized public-private partnerships to develop the Grand Parkway, U.S. 249, U.S. 290 and Texas 288 in the Houston area as well as three Dallas-area projects. TxDOT issued a Request for Information June 10 regarding development of the Grand Parkway and Interstate 35-E in Dallas. Grand Parkway responses are due Wednesday. Agency spokeswoman Kelli Petras said TxDOT is open to any idea but is leaning toward a public-private deal, also known as a P3 agreement, because of the state’s budget woes. Gornet said TxDOT’s request for information was not intended to emphasize a particular method of building the parkway. “If a P3 ends up being the best value for the citizens, so be it,” said Gornet, director of the nonprofit association established by TxDOT in 1984 to facilitate Grand Parkway development. I don’t have any problems with the concept of a public-private partnership; McBlogger would disagree with that, but I don’t think it’s necessarily a bad idea. What is a bad idea is spending billions of dollars to build a road in the middle of nowhere when there are far more pressing needs elsewhere. If we’re going to engage in urban planning on such a massive scale, we ought to do so in a way that gets a much bigger immediate return on the investment. By the way, I wonder what happens if TxDOT doesn’t get any worthwhile responses. I presume they’ll just extend today’s deadline and encourage those that had responded to step it up. Still, something to think about just in case. (Houston, TX) – As TxDOT hosts the final public hearings on its Statewide Transportation Improvement Program (STIP) Wednesday, a broad coalition of groups will hold press events in two locations to challenge the misplaced priorities of the transportation agency. While Harris County commuters suffer on 34 of the 100 most-congested roadways in the state, including US-290, the Texas Transportation Commission will squander our scarce tax dollars to fund the entire proposed 180-mile Grand Parkway around Houston. TxDOT’s Commission voted on April 28, 2011 to make Grand Parkway Segment E a statewide “priority” and assigned ~$350 million of statewide discretionary funds to expedite construction. This April allocation increases TxDOT’s planned expenditures to more than $4.8 billion for the Grand Parkway over the next four years. The 41 planned expenditures affect all project segments (B, C, D, E, F1, F2, G, H, I1, and I2) except for A. The 180-mile project will skirt largely uninhabited and environmentally-sensitive areas. TxDOT’s John Barton described the Grand Parkway as “an opportunity to open up areas for development” in Northwest Harris County, subsidizing private land development, and inducing more new roadway congestion. In contrast, TxDOT’s plan includes one-tenth that amount for US-290 projects, or just $468 million of the $2.3 billion needed for improvements TxDOT outlined in the US-290 Final Environmental impact Statement (FEIS). According to the Texas Transportation Insitute, US-290 is the 11th most-congested highway in the state, affecting more than 230,000 Houston-area commuters daily. Other than some initial work on the US-290/IH-610 interchange, TxDOT will mostly leave these taxpayers waiting for relief. “TxDOT’s unelected Commissioners have ‘found’ billions for a speculative toll road that will destroy the Katy Prairie in order to subsidize a few private land developers. Meanwhile, a quarter million taxpaying commuters will sit in traffic on US-290 indefinitely. TxDOT’s gross misallocation of our tax dollars is appalling,” says Robin Holzer, board chair of the Citizens’ Transportation Coalition (CTC). See here for more. Be sure to attend the TxDOT public meeting today from 4 to 6 to give your feedback on this. It’s at the TxDOT – Houston District Auditorium, 7600 Washington Ave.
How would you spend $350 million of TxDOT’s money? David Crossley would like to know. Let’s say you found $350 million to do a great transportation project for the Houston region. Would you use it to build a 400-foot-wide, 15-mile-long segment of brand-new highway across the Katy Prairie wetlands where almost no one lives or works in order to enable a lot of sprawling development (and some new flooding) for future residents? Or would you use it to, say, build commuter rail service along U.S. 290 to serve nearly a million people who live there today? The reason I ask is that there’s a public meeting next week where you could go and tell the Texas Department of Transportation (TxDOT) what you think would be a good (or bad) use of that money. The information about that is at the end of this article. Maybe you would tell them to use it to do a whole bunch of projects that we don’t otherwise have money for right now, like rebuild State Highway 6 and FM 1960 from I-10 to I-45? If you did all the proposals that are on the table for that corridor, you’d still have $315 million left. What then? Do 2920? 1488? Do all of them? You can go here for meeting info and here to get deep information about the STIP. You will be amazed. The meeting is from 4 p.m. to 6 p.m at the TxDOT–Houston District Auditorium, 7600 Washington Ave. Be sure to go and talk about how you would like TxDOT to spend that $350 million. Or at least send some comments to Texas Department of Transportation, Attention: Lori Morel, 118 East Riverside Drive, Austin, Texas, 78704, or by email to Lori.Morel@txdot.gov. Comments must be received by 5 p.m. Monday, June 6, 2011. Department officials will be surprised, I bet. You can also go to spend350million.org and leave a comment there. Speak now or forever hold your peace. No money for schools, but there is money for this. The Texas Transportation Commission [Thursday] morning unanimously approved allocation of $350 million for construction of the Grand Parkway’s Segment E in west Harris County. The $350 million approved [Thursday] morning comes from uncommitted dollars in the Texas Mobility Fund, said Kelli Petras, a spokeswoman for the Texas Department of Transportation. It was part of a total allocation of $775 million for Texas transportation projects, Petras said. See here, here, here, and here for the background. Yes, I know, the funding for this could not have gone to education or any other non-transportation purpose. It’s still a poor use of the money. Another step in the march of the inevitable. The state Transportation Commission on Thursday granted the Texas Department of Transportation authority to begin design work and negotiating contracts to build a key segment of the Grand Parkway. The unanimous vote did not, however, authorize funds to start work on Segment E of the tollway, which would link the Katy Freeway to the Northwest Freeway, just west of Fairfield. Williams, who chairs the Senate Transportation Committee, called the parkway one of his highest priorities. TxDOT spokesman Mark Cross said the agency estimates it will cost about $350 million to build the 15 miles of toll road linking Interstate 10 to U.S. 290. He said the agency has no construction time frame, but the Transportation Commission wants work under way as soon as possible. When completed, the parkway would be about 180 miles in circumference – running as far north as Tomball and New Caney, as far south as League City, as far west as Katy, and as far east as Baytown. The total price tag for the project is expected to exceed $6 billion. I don’t care to re-litigate all of this, because I know you know where I stand, but the Grand Parkway sure ain’t going to help alleviate any congestion I encounter. Beyond that, all I really want to know is where we’re getting the money for this, and what projects TxDOT will not be doing while it engages in this elaborate and unnecessary bit of exurban planning. The Solo Drivers … This is an obviously large portion of the population. But there are some very interesting variations in the extent to which different parts of town score on this count. In general, usege of this mode generally follows wealth and there’s some obvious high points where Metro’s reach isn’t as extensive as it is in other areas. What caught my eye in looking at this group, however, was the differences in some of the areas in the far northwestern part of the county. You can get a sense of that from the aggregate numbers, with the Memorial cluster clocking in at 85% and Third Ward clocking in at 60%. Public Transportation … A lot of this, again, tracks with income levels. This time, in a negative correlation – lower income areas use more public transportation. There is, of course, one very notable exception. That would be the DT/Rail cluster (13.9%), which has a share of users that compares very favorably with the Third Ward cluster (15.8%). If you compare the DT/Rail cluster to areas where income levels are more appropriate, the comparison looks like a lights-out argument for the advantages of light rail – 3-4X more usage and taking something on the order of 10% of the population out of cars that might otherwise travel by that means. If public transportation is a good option for people, many of them will choose it. That has many beneficial effects, including less traffic and better land use. How many of the people that will eventually live out by the Grand Parkway do you suppose will drive alone? Now superimpose a 2012 Solutions map on top of what Greg has and think about the effect that will have. What do you suppose the percentage of transit users will look like in the 2020 Census tracts? What might it look like if we invested in rail the way we’ve been investing in highways? Take a look and see what you think. “There are potential opportunities to help advance [the Grand Parkway] in its entirety over the short term,” according to John Barton, assistant executive director for the Texas Department of Transportation’s (TxDOT) engineering operations, told the Transportation Policy Council (TPC) of the Houston-Galveston Area Council (H-GAC) on Friday, according to Guidry News. Barton said the Texas Transportation Commission had voted on Thursday to “accept primacy” for the Grand Parkway, or State Highway 99. This came after Harris County Commissioners Court had earlier voted to ask TxDOT to take on the project and to reimburse the County for its expenses to date. See here for some background, and click the links above to see more of what was said about this. You have to wonder how an agency that’s basically broke can do this, but you’ll go crazy trying to make sense of it. Commissioners Court wants TxDOT to take over construction of the Grand Parkway. Harris County took control of the project about 15 months ago in the belief that the Texas Department of Transportation did not have the money to build it, and that the county could come to an agreement with the state over how toll collections would be used. Things have changed since then. First, County Judge Ed Emmett said, the Texas Transportation Commission has notified him informally that it expects to have $425 million available for the project this year. Second, the county has not come to an agreement with the state on the use of toll revenues. The state has insisted that all toll revenue collected on the Parkway (also known as State Highway 99) needs to be spent on the Parkway itself. The county wants to keep all the money collected on Harris County segments of the road in the county to pay for drainage projects, connector roads and other necessities the Parkway creates. “It is possible that the commission could commit some funding for Segment E in 2011,” said TxDOT spokeswoman Karen Amacker, if the county decides to give the Parkway project back to the state. “We do believe that it is an important high-priority project, not just for the Houston area but for the entire state,” she said. And I think it’s a terrible boondoggle that’s primarily going to hugely subsidize development in currently unpopulated areas. Why that’s a better idea than working to improve the parts of town where the people actually live remains a mystery to me. This story was written before the Commissioners Court meeting on Tuesday, at which they officially approved the plan. Let’s just say I’ll be hoping that there’s enough chaos in the Lege to make TxDOT lower the priority on this. Houston Tomorrow and KUHF have more. No money to fix traffic lights, but there’s always money for the Grand Parkway. Commissioners Court on Tuesday authorized the Harris County Toll Road Authority to negotiate with the Texas Department of Transportation over the development of three Grand Parkway segments inside Harris County with a total length of more than 40 miles. Segment E, which would run roughly from Interstate 10 to U.S. 290, is next up for construction. State legislation gives Harris County two years after it receives federal permits to start building. It has not yet received those permits, but the county won a lawsuit that challenged the project on environmental grounds. Yes, I know, it’s not a straight up trade of traffic signals for speculative toll roads in the middle of nowhere, but it’s instructive nonetheless. The problem many people have with the Grand Parkway is that it’s being built to address the perceived future traffic needs of people who will eventually move to this currently empty part of the county. The reason these people are projected to live there some day is, of course, because of this big honking road that’s going to be built first. It’s all very neat. Point being, Commissioners Court has for a long time now been committed to addressing the future needs of these future residents, even as the present day needs of people who are already here are being sacrificed. It’s a matter of priorities, and as far as the Grand Parkway is concerned those priorities have always been warped. 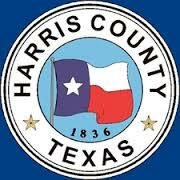 9:00 am Consideration of capital improvements for Harris County, Harris County Flood Control District, Port of Houston Authority of Harris County, and the Harris County Hospital District. On Tuesday, Harris County residents will urge Commissioners not to waste resources on the speculative Grand Parkway real estate project while 250,000 US-290 commuters need the relief of the Hempstead Managed Lanes as soon as possible. On US-290 each workday, 250,000 commuters sit in traffic. US-290 is widely-recognized as the most-congested highway in the Houston region. In 2007, TxDOT and Harris County released draft improvement plans for the US-290 corridor. These expansion plans include constructing new managed lanes, like the IH-10 Katy managed lanes, along Hempstead Highway from IH-610 out to Cypress and beyond. The plans repeatedly claim to the public that the Hempstead project will be constructed first, to give commuters new options, before TxDOT tears up US-290. The final plans, released in April 2010, still claim that the Hempstead lanes will come first. Also in 2007, Harris County fought TxDOT for rights to develop the Hempstead project. With SB 792, the Texas Legislature granted the County exclusive rights to Hempstead. Only Harris County can build the Hempstead Managed Lanes. Since then, TxDOT has designed $2.4 billion of improvements to US-290, but has no budget. Beyond reconstructing the US-290/IH-610 interchange, TxDOT has no funds on hand to add capacity to US-290 anytime soon. In contrast, the Harris County Toll Road Authority (HCTRA) is flush with cash. According to the County Auditor’s revenue estimate, HCTRA expects to collect $470 million in tolls in 2010/11 and is sitting on another $423 million in cash. HCTRA has $324 million for capital projectsbudgeted for 2010/11. They should be well-positioned to tackle the $2.2 billion Hempstead project. Unfortunately, it looks like 290 commuters won’t get any help from HCTRA, either. HCTRA’s capital plan includes no funds for the Hempstead relief project, but will spend $125 million for the Grand Parkway, a speculative toll road that will run through mostly-vacant and environmentally-sensitive areas of far northwest Harris County. In fact, according to the Houston-Galveston Area Council (H-GAC) Harris County intends to spend $2.01 billion on Grand Parkway in the next four year, as reported in the draft 2011-2014 Transportation Improvement Plan (TIP). That’s nearly enough to complete the entire $2.2 billion Hempstead Managed Lanes project. The County’s priorities are absurd when you consider that 384,000 people live in the US-290 corridor. In contrast, less than 15,000 live along segment E of the proposed Grand Parkway. It seems that Harris County Judge Ed Emmett and the Commissioners choose to subsidize developers of proposed new far-flung subdivisions rather than provide real mobility relief to current Harris County taxpayers. They obviously aren’t spending our money where the people are. To add insult to injury, new suburban development that follows the Grand Parkway will only make traffic worse on US-290. The next time I hear some blowhard like Randal O’Toole yammer on about the evils of urban planning, I’d like to ask him what he’d call this. Be there and make your voice heard if you can. It may not receive stimulus funds, but don’t go presiding over Last Rites for the Grand Parkway. Commissioners Court on Tuesday delayed a planned request to reallocate $181 million in federal stimulus funds for part of the 180-mile Grand Parkway project, after the Harris County Attorney’s Office said that any court order should be worded to ensure the county does not lose money paid out for acquiring right of way. Art Storey, who heads the county’s Public Infrastructure Department, notified the court last week that the Feb. 15 deadline for securing wetland permits for a 15-mile tolled segment of the parkway could not be met. In his letter to the court, Storey noted that a permit to fill wetlands from the U.S. Court of Engineers cannot not be obtained by the February deadline, adding that because of conflicts over environmental impacts and mitigation, it may never be issued. However, after Tuesday’s court meeting, Storey said the environmental mitigation issue could be worked out eventually. I don’t know if that’s wishful thinking or a warning to the rest of us to not get complacent, but be warned. This thing won’t go away on its own. The Court will revisit the matter Tuesday of next week, so stay tuned. As the Chron story headline says, it wasn’t so shovel-ready after all. This summer, the court approved the use of stimulus funds earmarked for Texas highway projects, declaring Segment E of the Grand Parkway outer loop project was closest to “shovel-ready“ status. The 15-mile portion of the road would link U.S. 290 with the Interstate 10 in west Harris County. The stimulus money is supposed to be used for “shovel-ready” projects, or those that are closest to actual construction but awaiting funding to begin. The recommendation to withdraw the project from the Texas Department of Transportation’s list of stimulus projects was made by Art Storey, who heads Harris County’s Public Infrastructure Department. Storey declined to comment on his recommendation until it is considered at Harris County Commissioner Court’s meeting next Tuesday. Well, good, in the sense that this was bad public policy. Not so good in the sense that it’s a missed opportunity – surely there was something else we could have requested funds for instead. Too late now. Commissioner Steve Radack, whose precinct contains the proposed roadway segment, described the loss of stimulus funds as “huge” development in the decades-long saga of the Grand Parkway project. Um, whatever you say, Steve. Houston Tomorrow suggests a reason for the permitting issues. The US Fish & Wildlife Service (FWS) and the Texas Parks & Wildlife Department (TPWD) formally opposed the proposed Grand Parkway Segment E wetlands permit, according to the Citizens’ Transportation Coalition. Both agencies submitted comments to the US Army Corps of Engineers, which is considering the permit application. The Segment E mitigation plan states that the project would impact 45.63 acres of wetlands, and it calls for the Harris County Toll Road Authority to purchase 23 acres of credits in the Katy Cypress Wetland Mitigation Bank and 22.63 acres in the Greens Bayou Wetland Mitigation Bank. However, FWS states that the project would impact a larger area, including areas outside the immediate right-of-way. In addition, the agency classifies the impacted wetlands as “medium quality,” while the mitigation plan calls them “low quality.” Medium quality wetlands require more mitigation than lower quality wetlands. In addition, FWS says it is “not appropriate” to use the Greens Bayou Wetland Mitigation Bank, which is 30 miles to the east of Segment E and in a separate watershed. Instead, the agency says that mitigation efforts should all be located in the Cypress Creek watershed. I know Steve Radack will never believe this, but maybe this really was a bad idea that is getting the fate it deserves. Just how viable is the Grand Parkway anyway? So it’s official, Commissioners Court has voted to seek stimulus funding for the Grand Parkway Segment E despite numerous concerns about the way they went about it. Houston Tomorrow explores a facet of this that I hadn’t been aware of before. Proponents of Segment E have come under fire in recent months for waiving a detailed financial analysis of the project, and the current proposal appears to be an attempt to mute that criticism. However, it comes four months after the Commissioners Court approved 30 engineering contracts worth almost $22 million, and five months after the seven counties voted to waive the market valuation process. The language of Tuesday’s agenda provides some flexibility, so it is unclear how detailed the viability study will be. The commissioners will also vote on increasing the value of one of the existing contracts, as well as purchasing two tracts of land to develop Segment E. The full agenda items are available at the bottom of this page. Videotaped testimony from last summer’s terms and conditions negotiating process, which is no longer available online, revealed that the entire Grand Parkway is revenue-negative. Art Storey, executive director of the Harris County Public Infrastructure Department, agreed with that assessment, telling the Commissioners Court in February, “The whole highway is demonstrably a loser.“ However, Storey insisted that Segments E and F, by themselves, are toll-viable. I don’t know that I have anything to add to this. Just keep it in mind the next time you hear someone complain about the cost of building rail lines. This is not a surprise, but it is a missed opportunity. Two-thirds of the country lives in large metropolitan areas, home to the nation’s worst traffic jams and some of its oldest roads and bridges. But cities and their surrounding regions are getting far less than two-thirds of federal transportation stimulus money. According to an analysis by The New York Times of 5,274 transportation projects approved so far — the most complete look yet at how states plan to spend their stimulus money — the 100 largest metropolitan areas are getting less than half the money from the biggest pot of transportation stimulus money. In many cases, they have lost a tug of war with state lawmakers that urban advocates say could hurt the nation’s economic engines. The stimulus law provided $26.6 billion for highways, bridges and other transportation projects, but left the decision on how to spend most of it to the states, which have a long history of giving short shrift to major metropolitan areas when it comes to dividing federal transportation money. Now that all 50 states have beat a June 30 deadline by winning approval for projects that will use more than half of that transportation money, worth $16.4 billion, it is clear that the stimulus program will continue that pattern of spending disproportionately on rural areas. There’s a sidebar graphic to the story that shows each large metro’s ratio of percentage of stimulus funding to percentage of GDP. The Dallas/Fort Worth region does better than Houston, getting 76% of its GDP share back in stimulus funds to Houston’s 42%. The 100 largest metropolitan areas also contribute three-quarters of the nation’s economic activity, and one consequence of that is monumental traffic jams. A study of congestion in urban areas released Wednesday by the Texas Transportation Institute found that traffic jams in 2007 cost urban Americans 2.8 billion gallons of wasted gas and 4.2 billion hours of lost time. I blogged about that the other day. Considering that a decent chunk of Houston’s share of this money is going towards the Grand Parkway Segment E, which won’t do a thing to alleviate congestion, Houston’s share of the pot is even less than it appears. Ryan Avent has more. Stimulus funds are coming to a road that may be near you. Texas received $2.25 billion from the stimulus for transportation. That’s on top of the $3 billion it got in federal highway funds this year. The regular federal allotment comes with restrictions. Certain percentages must go to improving safety, relieving air pollution and repairing bridges, for example. The stimulus money has comparatively few restrictions. Critics say decision-makers took the money and went on a lane-building binge — directing too much money to new roads, which will encourage more driving, and not enough to mass transit or repairing existing infrastructure. A little-known regional body, the Transportation Policy Council, decided how to spend most of the stimulus funds in the Houston area. The council represents the eight counties of the Houston metro region, and its 24 voting members are drawn from local governments and agencies such as the Texas Department of Transportation and the Metropolitan Transit Authority. It either chose stimulus projects directly or approved ones desired by TxDOT. The stimulus has one big requirement: Projects must begin soon, to create jobs and boost the economy. The Transportation Policy Council focused on projects that were “shovel ready,” meaning the necessary government and environmental approvals were in place. After that, the council looked for projects that had been waiting a long time for funding. 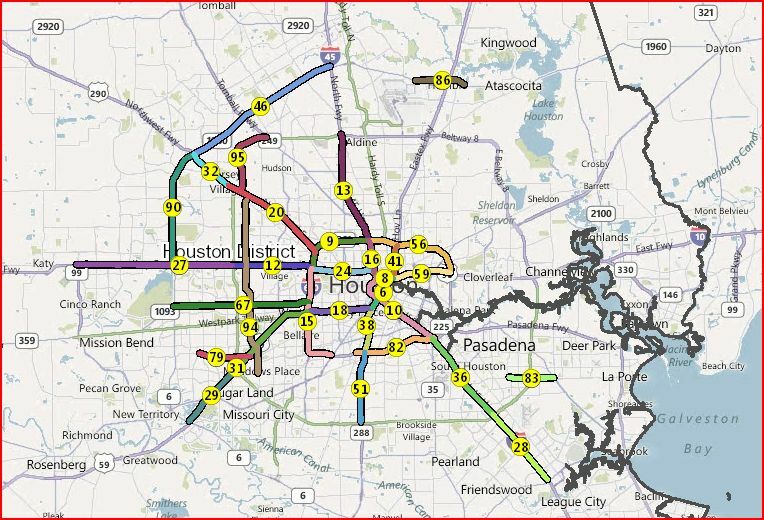 The transportation money is just one stream of stimulus funds flowing into Houston. The Port of Houston got $98 million to dredge the Ship Channel. The Federal Transit Administration allocated $105 million for buses, light rail and Park & Ride lots. But that’s still less than the $181 million set aside to build a section of the Grand Parkway outer loop in an undeveloped part of west Harris County. Except for the Grand Parkway and a road widening in Stafford, all 15 major road projects getting a boost from stimulus money will be fully funded by it. The Grand Parkway segment is estimated to cost $607 million, and some think that won’t be money well spent. “There are no people out there,” said Robin Holzer, chairwoman of the Citizens’ Transportation Coalition. Holzer said the money should have been spent to relieve traffic on U.S. 290 or for commuter rail. No question, spending stimulus funds on the Grand Parkway is a terrible idea; of course, the Grand Parkway itself is a terrible idea, but it’s one that has juice behind it. It’s a damn shame there wasn’t a better process in place, one that would have rejected this project for stimulus funding, but there’s nothing we can do about that now. Smart Growth America, a national urban planning coalition, said Texas spent almost half its stimulus road funds on new roads or extra lanes. By contrast, Maryland and North Dakota spent all of theirs on maintenance. Studies show that repair work on roads creates 16 percent more new jobs, according to the coalition. You can get that full report here. As we know, Metro will get a little bit of stimulus money. More would have been nice, but what really matters now is getting funding through the regular appropriations and approval process for the remaining light rail lines. If we can get that done, it’s all good. Christof notices a banner ad on chron.com for the Katy Freeway managed lanes, which are set to open on Monday, April 18, and gives us an update on them. The lanes will now be open 24 hours a day, 7 days a week. Outside of rush hours, they’re a toll road: every car, regardless of how many people are in it, pays $1.10 to go the full length of the lanes. During rush hour, in the rush hour direction, single occupant cars pay between $2.00 and $4.00 and 2+ carpools are free. Those rates will need to be adjusted if the lanes are too popular, because HCTRA (who operates the lanes) has promised METRO (who gave up the HOV lane to make room for them) that buses will keep moving at full speed. Single occupant vehicles and carpools will be sorted out by a three-lane toll plaza: left lane for carpools, right two lanes for SOVs. I guess they’ll have some sort of video surveillance to ensure that single occupancy vehicles are not trying to sneak through the non-toll lane. I predict that some time in the next year or so, we’ll see a story reported on how whatever system they have for monitoring this still has a few bugs in the system. The only question is whether they err on the side of caution or aggression. Across the country, people have shown a distaste for tolls when a free option is available. Toll roads like Beltway 8 that don’t duplicate a freeway do well. Toll roads like the Hardy that do tend not to fill up. And Houston’s first managed lanes are in a corridor that just had a lot of free capacity added. We may also begin to see problem with the lanes themselves. Nearly all the on- and off-ramps are from the regular lanes. If those lanes get congested, getting to the uncongested managed lanes will be hard for both carpools and buses. Some more direct ramps like those at Addicks and NWTC would have helped. I think even if the free lanes don’t get too congested, having more vehicles cutting all the way across the highway to get on and off is going to increase the number of accidents. But maybe not so much if the free lanes stay relatively free-flowing. I wonder if anyone will do a study of this. Houston rail transit in an alternate universe. Maybe we are better off not having approved earlier rail referenda. Why the feds like pavement and not rails. Don’t even get me started on this. The transportation stimulus comes home. A look at where federal transportation stimulus money will be going around here. Some of it will even be spent on non-boondoggle toll roads. The map – now with officially approved colors. 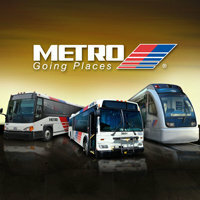 An update to the Metro 2012 Solutions map, with station locations and other useful information. Who says Harris County is flat? Not County Commissioner Steve Radack, who is building a hill in Hockley for soap box derby enthusiasts. It is a vision seven years in the making for Radack, who predicts the hill will draw hundreds of derby enthusiasts from around the region and across the country, along with runners, hikers and possibly even skateboarders. Built using dirt excavated to create a chain of lakes at Katy’s Paul D. Rushing Park, the 50-foot incline will allow the motorless cars to zip downward with the aid of gravity at speeds approaching 35 mph. The project’s estimated price tag has grown from $300,000 to more than $2 million as the plans became more elaborate, including adding an amphitheater on the hillside for concerts and community events. Although the county is facing a budget crunch that has forced some departments to cut spending by millions of dollars, Radack said parks are an ideal investment in a time of economic uncertainty. It is hard to pinpoint exactly how much the county has spent on the hill since the main $6.1 million contract in 2007 covered both excavating the dirt to create the lakes and trucking it 12 miles to build the hill. Radack said most of the money was spent on the lake excavation, but he did not have an exact tally. The hill was finished about a year ago and has been allowed to rest so the dirt can settle and stabilize. Well, at least now I have a better understanding of why Radack cares so much about how long it takes to drive between Hockley and Houston. Federal transit officials on Tuesday reversed course and agreed to allow Metro to use nearly $30 million in economic stimulus funds for utility relocation work on the proposed North and Southeast rail lines, Congresswoman Sheila Jackson Lee announced. Just last week, Metro was told such stimulus funds could not be used on the latest extensions of the rail lines because the projects were not deemed “shovel-ready.” Instead, the Federal Transit Administration recommended Metro use its stimulus funds for converting 83 miles of high occupancy vehicle lanes to high occupancy toll lanes. Jackson Lee said the about-face — announced in “letters of no prejudice” from the FTA — followed U.S. Transportation Secretary Ray LaHood’s visit to Houston earlier this month. LaHood, who was invited here by Jackson Lee to see the light rail line, spent all day March 13 meeting with Metro supporters, officials from various universities and other public institutions. “He was able to ride on the (rail) system and meet with the head of Texas Children’s Hospital, who was able to explain how vital the system was,” Jackson Lee said. Of the total $28.9 million in federal stimulus funds freed up for Metro’s rail plans, $19.2 million is earmarked for utility relocation work on the North Corridor Light Rail, while $9.7 million will be devoted to relocating utilities for the Southeast Corridor Light Rail. The key to getting the economic stimulus funds was proving that Metro could start the work within 90 days — a requirement to secure the federal monies, Jackson Lee said. The utility relocation work can be contracted and people hired to do the work immediately, she said. Of course, the definition of “shovel ready” is different for rail projects than it is for toll road projects. But we’ll take what we can get. If we must build the Grand Parkway Segment E, then this would be a far more preferable way to do it. Probably less expensive, too. Harris County Commissioners Court on Tuesday approved an agreement to build and maintain a segment of the Grand Parkway connecting the Katy Freeway and U.S. 290, but questions over what would happen if the county ultimately decided the project was not financially viable could delay work indefinitely. The agreement with the Texas Department of Transportation clearly states that Harris County would be reimbursed for its investment in Segment E of the proposed “outer outer” loop around Houston if another entity agreed to develop the entire 185-mile project. But the agreement does not describe what would happen if the county decided not to build the segment after spending money on the segment and no one ever agreed to build the whole project. After a lengthy discussion during Tuesday’s meeting, the court voted to accept the agreement anyway. But Commissioner Steve Radack said later he does not want the county to spend any money until he knows for sure who would reimburse those expenses and how quickly that would happen. “I am not going to put $20 million-plus dollars worth of county money on a toll road roulette wheel,” he said after the meeting. TxDOT spokeswoman Raquelle Lewis declined to speculate on whether the agency would agree to those terms. In other words, it is unclear whether or not there’s a “No Backsies” policy in effect. May I suggest that when this inevitably winds up in court that the county retain Harvey Richards as their attorney? On a more serious note, this vote went through despite there being numerous unanswered questions about the project’s financial viability, and the use of stimulus funds on a toll road. Citizens’ Transportation Coalition chairwoman Robin Holzer said the county should not invest any more money in the segment until that study is completed. “Harris County has a responsibility to every toll road user in our region to slow down and do this right,” said Holzer, whose mobility advocacy group argues that Segment E will do little to address pressing traffic concerns while helping developers get rich building sprawling subdivisions on the Katy Prairie. Art Storey, the executive director of Harris County’s Public Infrastructure Department, acknowledged that deadlines associated with accepting $181 million in stimulus funding for the project are prompting county leaders to move expeditiously. Construction must be completed within three years, according to the Texas Department of Transportation. Storey said the county has been negotiating with TxDOT for permission to build the road since last June, hoping it would ease traffic on U.S. 290 by diverting some drivers to the expanded Katy Freeway. “Stimulus money was not in anybody’s vocabulary when we asked for permission from Commissioners Court to negotiate with TxDOT,” Storey said. If anyone truly started moving more quickly after the stimulus money became available, it was TxDOT, he added. The $181 million allocation was among $1.2 billion in stimulus projects the Texas Transportation Commission approved last week. The new “investment-grade” study would build upon similar but less detailed analyses conducted in 2004 and 2008 that showed the segment is toll-viable, meaning it would pay for itself over time. An investment-grade study involves an extensive analysis of local traffic and economic data to let potential investors know what kind of risk they would be taking. Previous studies showed most of the other Grand Parkway segments would not be used enough individually to recoup the cost of building them. However, the entire project could be revenue neutral over the years if the highest-grossing segments subsidized the lowest-grossing ones, Storey said earlier this year. The real question is whether existing toll roads such as the Westpark or the Sam Houston would be used to cover any shortfalls on the Grand Parkway. “Could be revenue neutral over the years” leaves an awful lot of room for things to not go as hoped, after all. Representatives of a broad coalition of quality of life, political reform, and environmental groups and citizens from across the state are requesting that the five Commissioners of the Texas Transportation Commission (the Commission) slow down and revisit the transportation projects that they will vote on Thursday morning at 10:00 AM to include in Texas’ request to the Federal government for use of American Economic Recovery Act transportation funds. The Commission has the authority to delay the vote and tell the Texas Department of Transportation (TxDOT) to reconsider the project list. With $1.2 billion of stimulus funding at stake, many Texans, including Texas legislators, have raised red flags, citing a lack of transparency and fairness in the process led by the TxDOT and culminating in the vote by the Commission today. The concerned groups charge that TxDOT failed to address environmental and quality of life issues, including development of alternative forms of transportation. That vote was taken yesterday, and TxDOT went ahead with its original plans anyway. The fight isn’t over – as noted before, among the projects in scope for this is the Grand Parkway Segment E, for which there are still many hurdles to be cleared, and thus many more opportunities for the public to push back. TxDOT is also still subject to a sunset review this session, and their actions here can and will be used as evidence of whether or not they’ve made any substantive changes as they’d promised. The rest of the release is beneath the fold. I will note that if you’re one of those people who thinks Metro should have been more transparent in their negotiations with Parsons, you ought to be holding TxDOT to a similar level of scrutiny. It’s still the public’s money, after all. The agreement stipulates that Harris County will be responsible for funding right-of-way acquisition, engineering and design, utility work, environmental studies and mitigation, compliance with TAS and ADA, and any other aspect of the project not mentioned in attachment D. According to this agreement Harris County will be on the hook for the entire estimated project cost in excess of $500 million. Before voting Cmr. Steve Radack pushed staff to clarify the County’s financial obligations saying, “I don’t want Harris County tax payers to be out one penny on this project.” He asked what happens if the County moves forward on segment E but decides not to finish the project. Attorney Bob Colley, who worked on the agreement for the County, explained that the County will only be reimbursed for segment E costs if TxDOT or another entity ultimately assumes responsibility for it and the entire Grand Parkway. If HCTRA develops segment E and no one takes it over, the County will be out the entire cost. Commissioners also clarified the County’s obligations stemming from this agreement. In conclusion, today’s vote allows the County to pursue segment E, but does not obligate the County to begin spending money on it. Emphasis in original. That’s a lot of money hanging on a what-if, isn’t it? About 10 representatives from environmental and neighborhood groups that oppose the project spoke against it during Tuesday’s meeting, calling it a magnet for sprawl that will be too far north to have much of an impact on U.S. 290 traffic. They said the court should use the money to build commuter rail or toll lanes on the freeway instead. A detailed list of reasons why this isn’t such a hot idea can be found in this post from last year, when this project was fast-tracked. I agree with the point Jay Crossley made in the comments to that post, which is that this represents urban planning in another form. Somehow, though, those who object to that idea don’t ever seem to have a problem with it when it’s done this way.